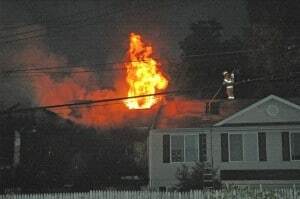 U.S. fire departments responded to an estimated annual average of 373,900 home structure fires from 2005-2009 according newtoresearchfrom the National Fire Protection Association (NFPA). According to the report, cooking fires remain the leading cause of home structure fires and home fire injuries and smoking materials continue to be the leading cause of home fire deaths. During the five-year period covered by the report, roughly one in every 310 households per year had a reported home fire. Each year, these fires caused an estimated average of 2,650 civilian deaths, 12,890 civilian injuries, and $7.1 billion in direct property damage. On average, seven people died in U.S. home fires every day. One-quarter of the home fire deaths resulted from fires that originated in the bedroom, 24% from fires in the family room, living room, or den, and 15% from fires starting in the kitchen. Though only 20% of reported fires occurred between the hours of 11:00 pm and 7:00 am, half of the deaths were caused by fires reported during this time. Almost two-thirds (62%) of home fire deaths resulted from fires in which no smoke alarms were present at all (38%) or smoke alarms were present but did not operate (24%). The report also referenced John Hall’s recent report, U.S. Experience with Sprinklers, which found that having wet pipe sprinkler systems in the home reduces chances of dying in a fire by 83%. Watch your cooking Stay in the kitchen when you are frying, grilling, or broiling food. If you must leave, even for a short time, turn off the stove. Give space heaters space Keep fixed and portable space heaters at least three feet from anything that can burn. Turn off heaters when you leave the room or go to sleep. Smoke outside Ask smokers to smoke outside. Have sturdy, deep ashtrays for smokers. Keep matches and lighters out of reach Keep matches and lighters up high, out of the reach of children, preferably in a cabinet with a child lock. Inspect electrical cords Replace cords that are cracked, damaged, have broken plugs, or have loose connections. Be careful when using candles Keep candles at least one foot from anything that can burn. Blow out candles when you leave the room or go to sleep. Have a home fire escape plan Make a home fire escape plan and practice it at least twice a year. Install smoke alarms Install smoke alarms on every level of your home, inside bedrooms and outside sleeping areas. Interconnect smoke alarms throughout the home. When one sounds, they all sound. Test smoke alarms Test smoke alarms at least once a month and replace conventional batteries once a year or when the alarm chirps to tell you the battery is low. Replace any smoke alarm that is more than 10 years old. Install sprinklers If you are building or remodeling your home, install residential fire sprinklers. Sprinklers can contain and may even extinguish a fire in less time than it would take the fire department to arrive. About the National Fire Protection Association (NFPA)NFPA is a worldwide leader in fire, electrical, building, and life safety. The mission of the international nonprofit organization founded in 1896 is to reduce the worldwide burden of fire and other hazards on the quality of life by providing and advocating consensus codes and standards, research, training, and education.